Houses under construction in Toronto on June 26, 2015. That drop was offset in part by a 9.5-per-cent increase in single-detached urban starts to 63,659. Meanwhile, rural starts were estimated at a seasonally adjusted annual rate of 16,976 units. The housing sector is being watched as it adjusts to higher mortgage rates, new mortgage-lending rules that were brought into force at the start of the year and other changes. Home sales figures for March are expected on Friday. 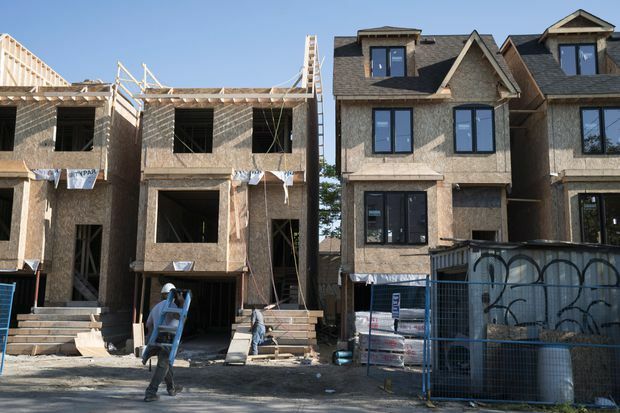 In a separate release on Tuesday, Statistics Canada said municipalities issued $8.2-billion in building permits in February, down 2.6 per cent compared with January. The decrease, which suggests a decline in builder intentions, came as the total value of residential building permits dropped 0.3 per cent to nearly $5.3-billion. The value of permits for single-family dwellings fell 1.6 per cent to $2.6 billion, while permits for multifamily dwellings increased 1 per cent to nearly $2.7-billion. The value of non-residential permits issued fell 6.6 per cent to nearly $2.9-billion.